If you have twenty windows open and you want to close them but it is a very painful task as you need to do it one by one. 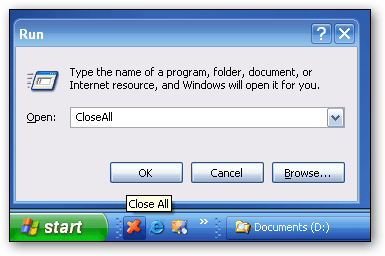 So, today I will tell you about a software which can close all running application with one click. It does not use system resources because it only flashes a “close” signal to all open windows on the desktop and then ceases. This program is a portable application and it’s size is only 18 KB. For quicker use of it, you can make a shortcut of it and drag and drop it in the Quick Launch. never heard before of this portable application, I think could be very useful. downloaded, unzipped and stuck it into a folder works fine.